So, hello, first I’d like to admit that today is not today. 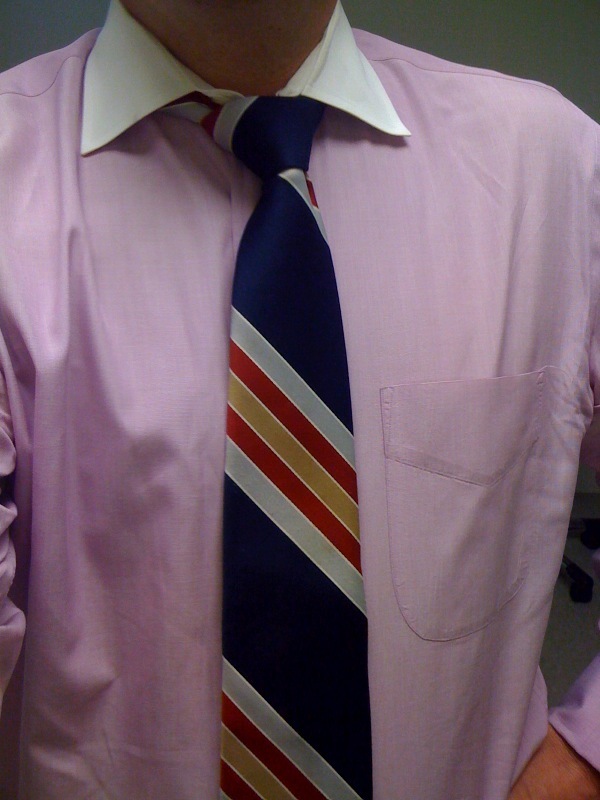 I’m writing about Friday’s Tie du Jour, and press time is actually Monday evening, Memorial Day. I will do my best to avoid ripping the fabric of the space-time continuum (amazing how many movie scripts are googlable) by pretending to only know about the events of Friday. I will not write about my daughter’s surprise birthday party (it was a surprise because it was two months after her birthday…nyark), nor will I write about my pal [RED ALERT! Name dropping warning!] Dave Eggers stopping by the party. Should Julia read this post, she may find out about the party, go back in time and then be completely unsurprised. Confused? Yeah, me too. Real today has been spent in the sun, so my brain isn’t well too working. On to the TdJ! It is a special tie, and by special I’m not saying that I got it from one of my grandmothers for my high school graduation (you, know, reader…commencement is NOT an ending. It’s a beginning.). It is special in the holy-crap-I-can’t-believe-this-passed-for-fashion-in-the-70s way, as well as the holy-crap-it’s-passing-for-fashion-in-the-10s-maybe way. This yellow, blue and green polyester (told you it was special) number comes from The Men’s Store at Sears. Growing up in Memphis, there was a large Sears department store about a mile from our house. I remember spending a lot of time there, but I don’t recall being in the section called The Men’s Store. I wish I could have seen the tie area. They probably had round-the-clock firemen on watch, due to the inordinately high polyester density in the building. And the way people smoked indoors back then, it’s amazing the whole tie table didn’t go up in multi-colored smoke. After the long weekend (which is almost over now, boo hoo) comes Tuesday, which is going to be quite a milestone. My last day at the Chamber, as I have mentioned, and it’ll be Tie No. 299. Either I’ll wear two that day to get to 300, or I’ll wear another one Wednesday. By any stretch, I’ll probably take a break for a few days, at least through the end of the week. I need to get a routine going with Few Spirits, and with my other stuff. I probably should wait until July 4 to honor those words from the Declaration of Independence, but I probably won’t wear a tie then. So, the Thursday before Memorial Day gets the nod. Ironically, I’ll be touting a tie that comes from the colonial oppressor that caused Tommy Jefferson, Johnny Hancock and the rest of the Yank rabble rousers to pen it. The Tie du Jour is another from Liberty of London. This must be my 5th or 6th Liberty, most of which came through my dad’s collection. This one had a great blue and pink floral pattern, and like the others it’s a bit different in that it’s 100% cotton. I’m coming up on my last day at the Evanston Chamber. Tuesday will be bittersweet, obviously, and a bit nervy. I feel a bit as though I’m stepping off a pier without knowing what’s down there. I’m pretty sure there’s water, and I’m hoping it’s warm and swimmable. I know I have a lot of friends, families and supporters that have been wonderful as I have inched closer to this decision. There will be no sink, only swim, and the excitement will make this a great choice. As for my destination, the main landing point is Few Spirits, a microdistillery founded by my great friend (and GWT alum) Paul Hletko. I will be the brand ambassador, providing tastings all over the Chicago area, whilst introducing our products to the imbibing public. We will soon be offering tours and tastings at our facility in SE Evanston, so I look forward to your visit. May as well stick to rock, as I tramp back to the AC/DC well once more (Tieway to Hell was the other). This little ditty has anthem written all over it. Anyway, on to my Wednesday, which truly was a day full of Wednes, whatever that may be. 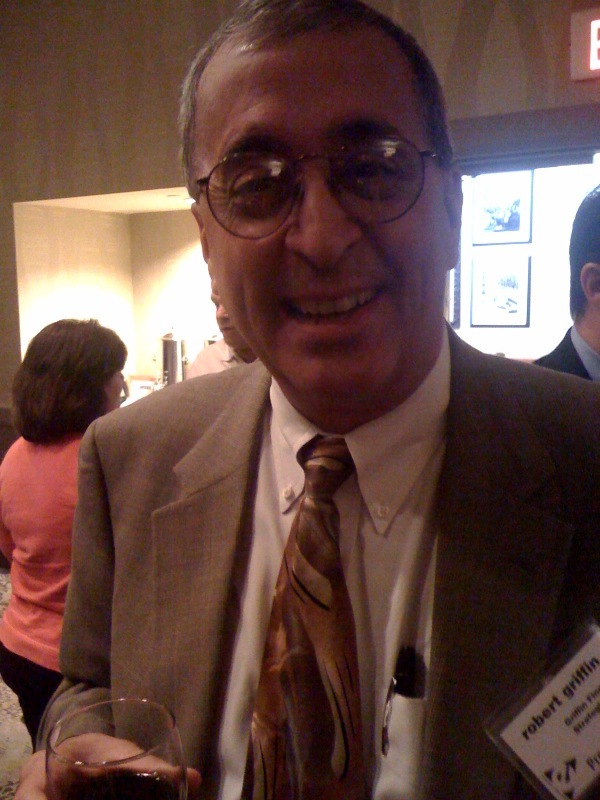 If Wednes is networking, then yes, I had that, as our Business After Hours was held this evening. My Tie du Jour for this occasion was a late pickup from Unique Thrift Store. It’s from Joseph & Lyman, a mark of Bloomingdale’s, due to the fact that the store was founded by brothers Joseph and…and? Take a guess. Yessiree, Bob [insert your name here if it isn’t ‘Bob’], it’s Lyman [you shouldn’t insert another name here, since ‘Lyman’ is the correct answer]! 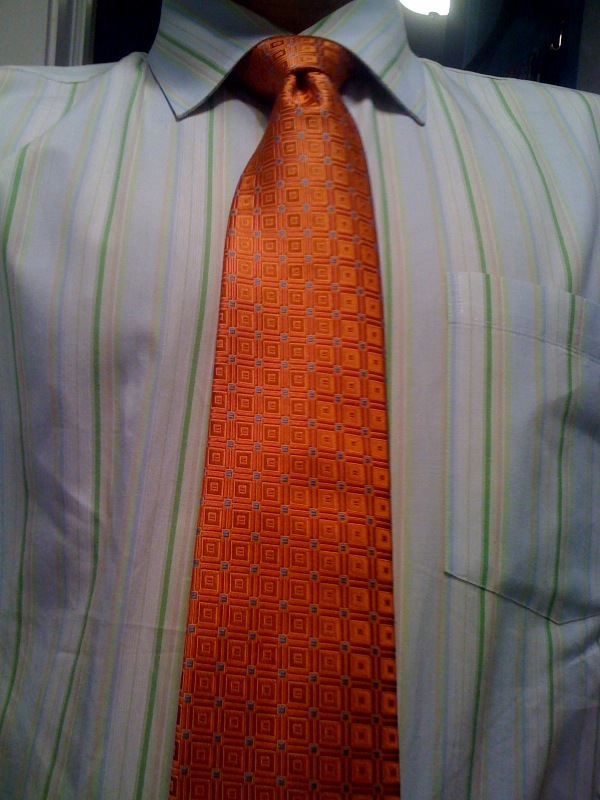 Throwing it with this shirt was kind of a lark, but I think it works out okay, as the shirt actually has a little orange stripe next to the green one. 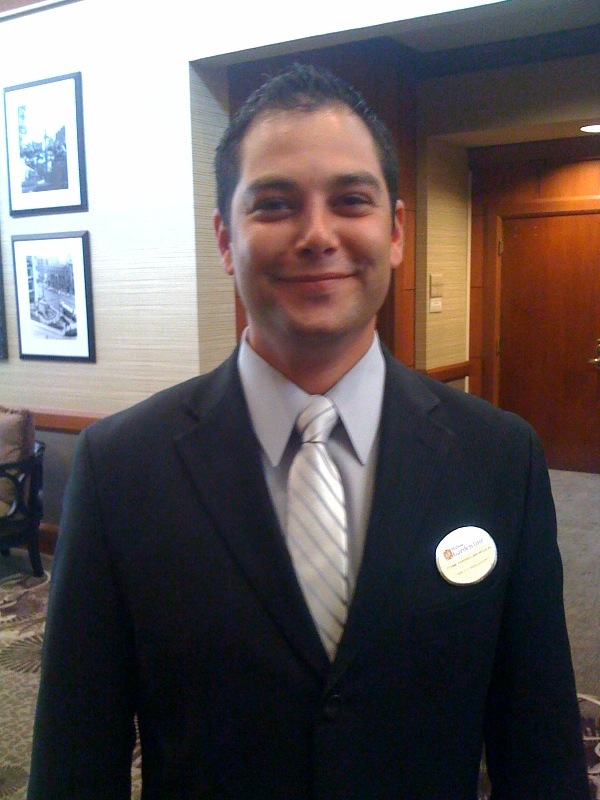 Of course, since it was a networking event, we had a couple of GWTs in attendance at the Hilton Garden Inn. 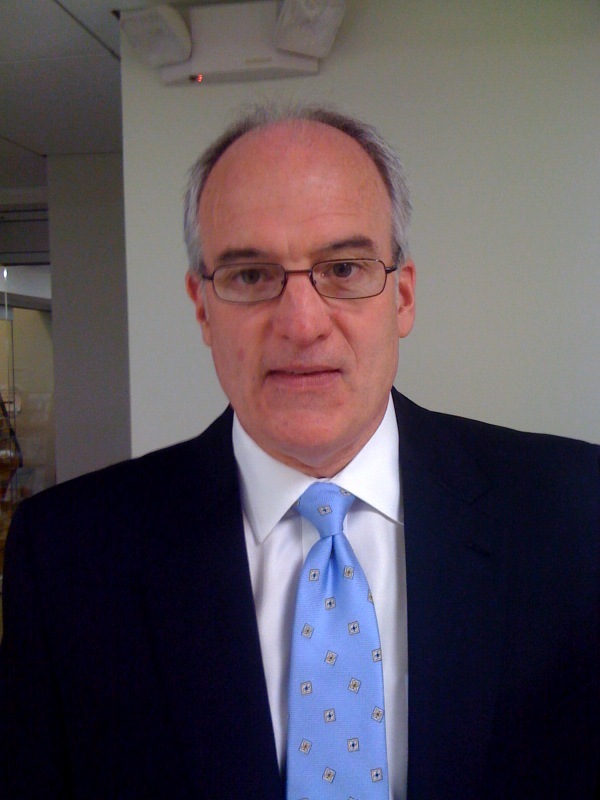 First, we have Tom Hegelberger, HGI’s new sales guy (sorry, Tom, wasn’t sure the exact title…I doubt “sales guy” will be on your business cards). He is a big fan of ties, so we’ll have lots to talk about. 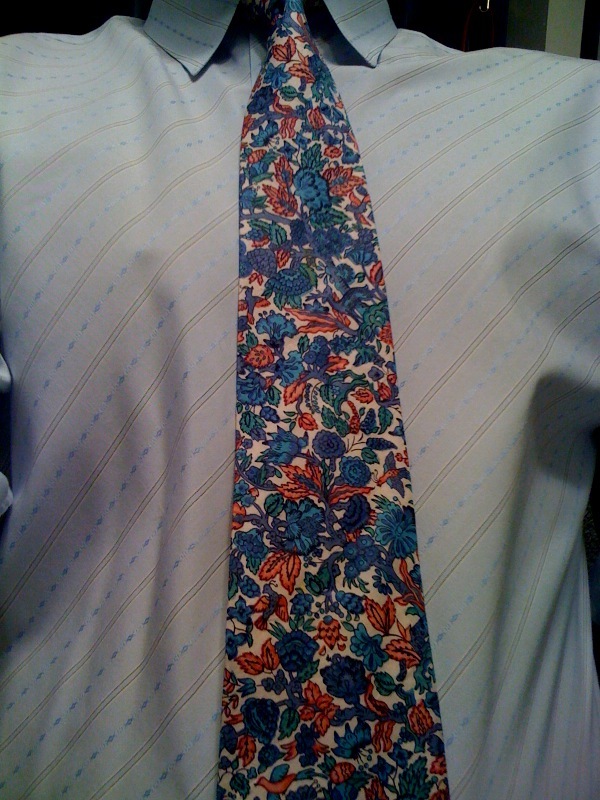 And, Robert Griffin, of Griffin Financial Strategies, was sportin’ a sweet Jerry Garcia tie. You get to me you’re always outta champagne. You ain’t nothin’ but a waitress in the sky. Love love love that song, the ‘Mats rockin’, rollickin’ homage to the flight attendants in attendance. Love it even more that it talks about tie-wearing, or the lack thereof. Chances of finding a pic of these guys posing as Rockers With Ties was slim at best. 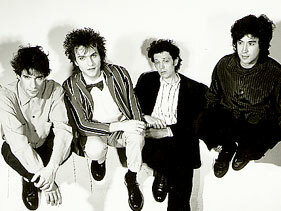 But the good Google giveth, and I believe that’s Tommy Stinson in the candy-man coat and bow tie. Tommy Gets His Tonsils Out indeed. 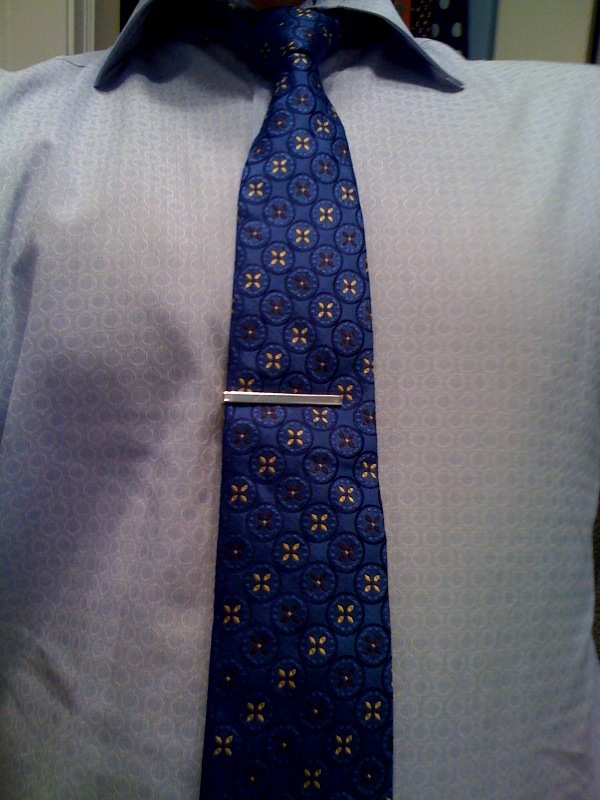 My Tie du Jour is a Jenny Special…that is to say Jenny found it at a resale shop for me, which make it special. It has a bit of special significance to Evanston history, as it hails from Wieboldt’s, a defunct department store, one of which was in Evanston. 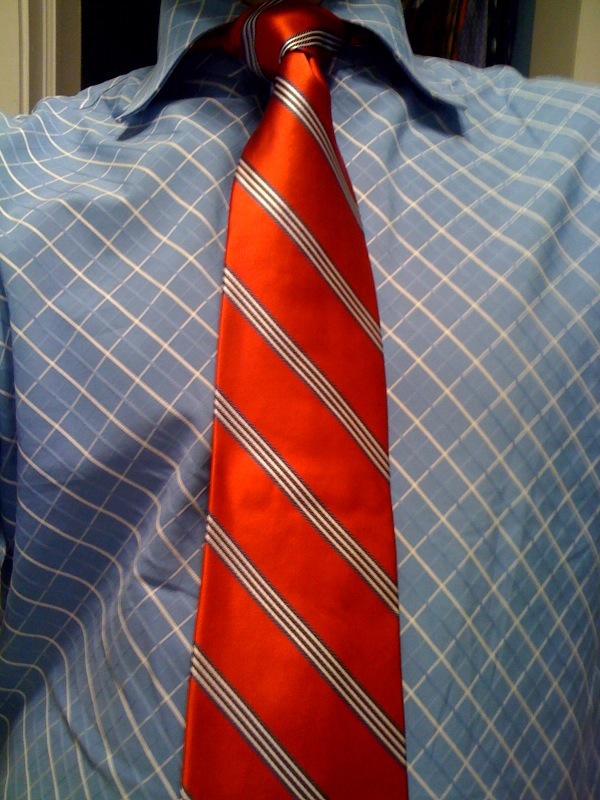 And, I must give credit where credit is due: my crapiPhone actually captured this tie perfectly. It’s such a dark navy that I thought it would look black. Well done, ciP. Should have done an ensemble pic with this one, especially with the white/brown saddles that topped it off (or bottomed it out I should say). 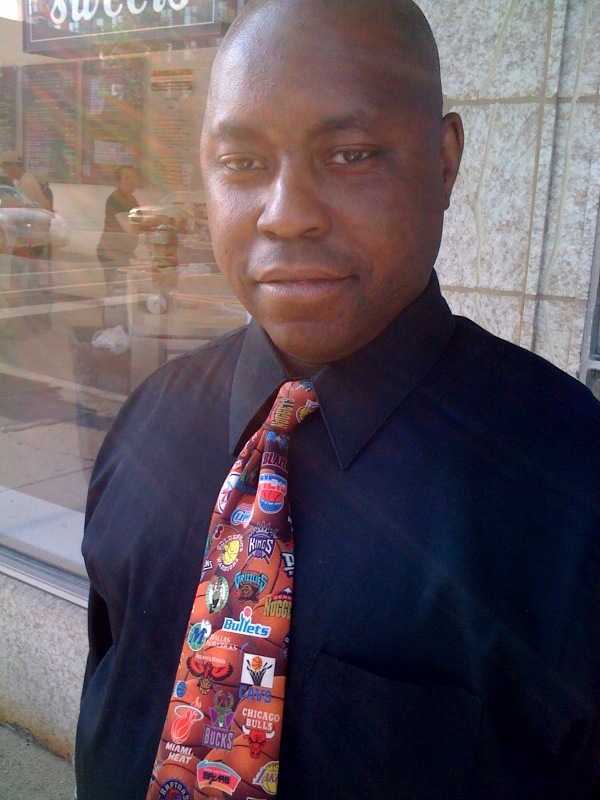 While picking up dinner over on Dempster Street, I met a waiter at Blind Faith Cafe who had a very timely tie on. Stan was wearing this cool NBA strip, which was in honor of the Bulls playing that night. Too bad they lost, and are now facing 3 straight (hopefully) elimination games. I wish I could come up with a nice little self-deprecating story that gets to the heart of the ‘fool me once’ expression. Of course, as I wrote that, I thought of one. I wasn’t fooling or surprising anyone with my Monday TdJ choice (Tie No. 294, by the way), although some may call me fool for wearing paisley with this plaid shirt. Nah, I’m no fool, just willing to have a tie pop, I guess. This brown, blue and white strip from Carter Holmes is a Giddings Special, gleaned from the bag o’ ties given to me by Paul & Cease Giddings. CrapiPhone camera makes it look yellowish, too…hmm. Monday was my last board meeting at the Chamber, and I managed to find a new Guy With Tie. 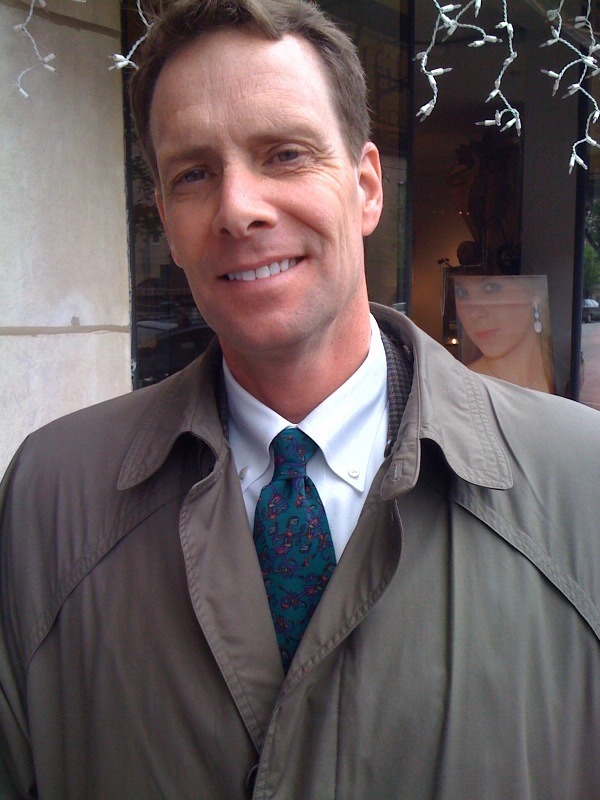 David Kane is VP of Senior Living at Mather LifeWays, a retirement community corporation HQed in Evanston. Really like this blue, as you know. 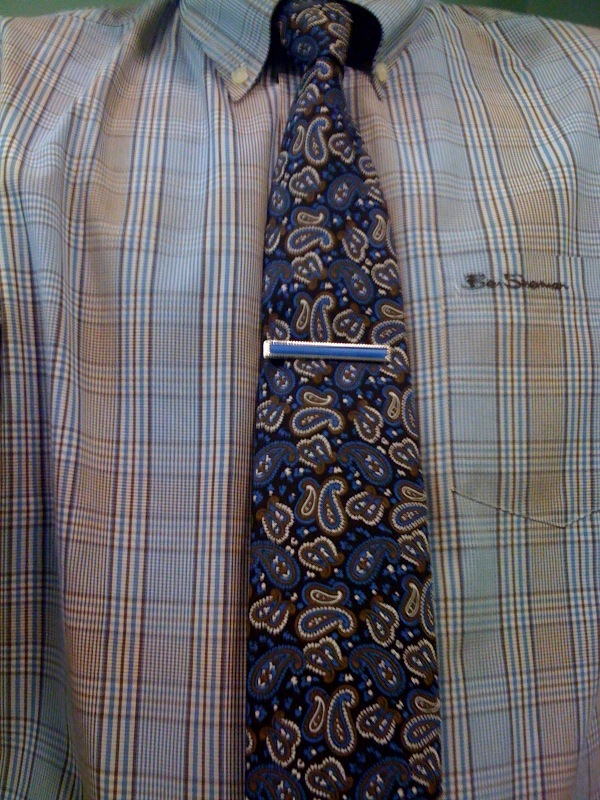 He spotted my tie clip, and showed me his cool cuff links as we had an accessories conversation. Speaking of Davids, my roving photog (aka “Mom”) was at a funeral down in Louisiana (my great Aunt, “Tante Chick”, passed away last week) and used the opportunity to shoot some ties. 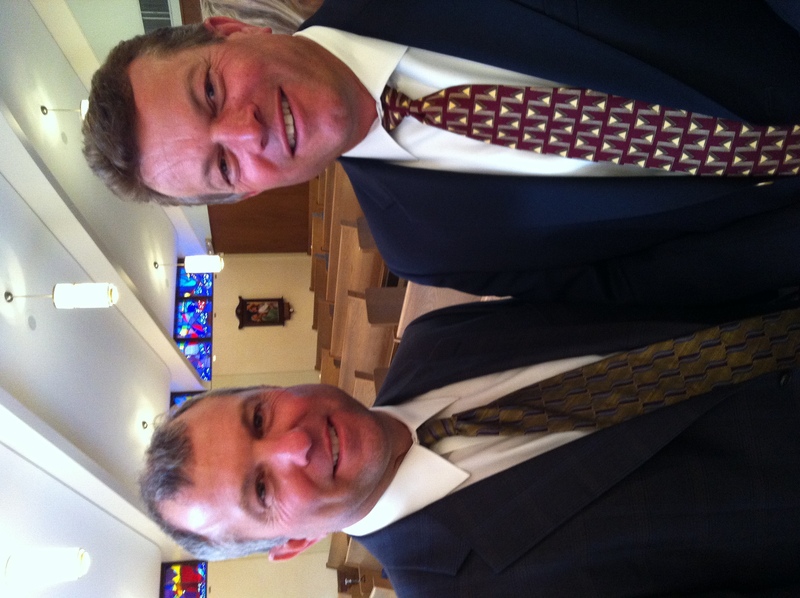 My first cousins David and Mark Huval are here (Mark’s on the left). So funny…to this day, I still associate certain musicians to them, as they were (with some other cousins) my first influences on music. Mark had a bunch of Bruce Springsteen LPs, while David was a Rod Stewart fan. While I’m sure they listened to many other artists (oh yeah…Eddie Money and Boz Scaggs), these are just imprinted on my mind. She also got another couple of cousins, with a different family connection: this pair are separated by a couple of generations. 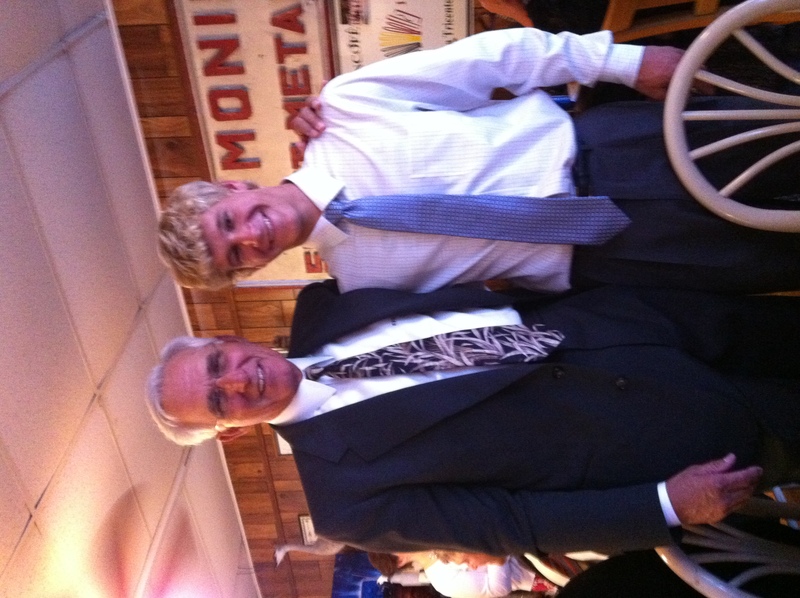 Roland Dugas and his grandson Jacques. Mom says that Jacques is already a nationally-ranked pole vaulter. Man, I can’t imagine what kind of strength that takes. So, if you’re reading this on May 22, be happy that there has been no judgment, and rest assured that there will be posts next week. After that, however, it’s going to get tricky. I’ve gotten the word that my last day at the Chamber will be May 31. After that, my tie-wearing days will likely wane. I’ll still don them when I take up my duties as Brand Ambassador for Few Spirits, and I’ll still wear a different tie every day. But, I will probably get down to 2 or 3 posts per week…and who knows, it may be 4 or 5. My Tie du Jour was not chosen with the looming End O’World in mind; it just kinda popped out and said “Wear me!” It’s a vintage thin from Excellon Abbey, which sounds like a monastery where they create polyester and other faux fabrics under a vow of silence: “O Lord, Bless this synthetic cloth! Work of human hands, let it chafe and age poorly, and if Thou need, it can spontaneously combust and become the de facto burning bush of the 20th century!” Yeah, I’m sure that’s what they would have said at Excellon. The TdJ is black with dark green circular markings that may be tough to see here in the photo. I forgot to add a picture of a GWT alum that I ran into yesterday. 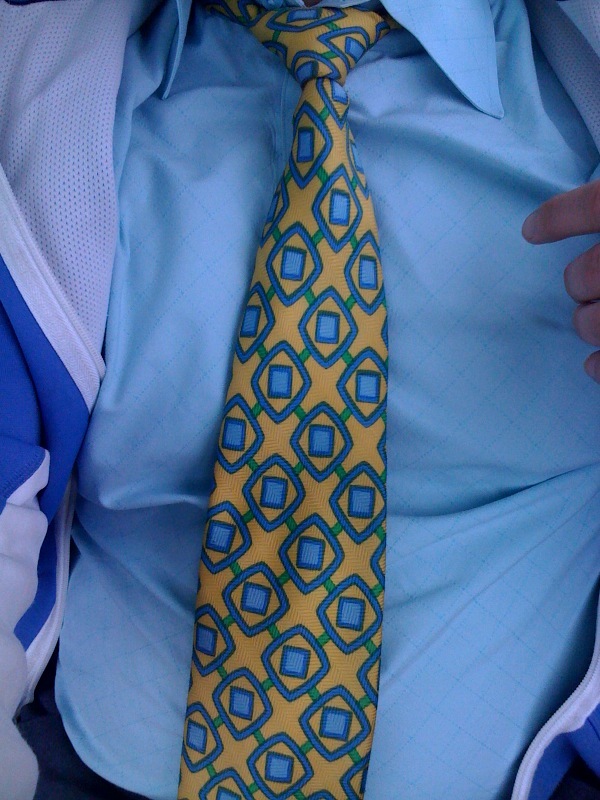 Jim Nash, a commercial realtor with Farnsworth-Hill, was roaming about town in this cool tie. Of course, my crapiPhone isn’t zoomy enough to capture the detail of the sinewy creatures depicted on said cool tie. Just trust me. This is good, right? I spent much of Thursday thinking it was Monday or Tuesday. Being so far off probably has other mental implications, but imagine my joy when I realized that it was indeed very close to the weekend. Go ahead, I’ll give you a couple of seconds to imagine it. Got it? Isn’t that nice? I was reminded of another nice thing this morning, when my trustiPhone calendar (it’s much more trusti than my crapiPhone camera) informed me of an impending meeting with Angela and Scott, the good folks at Paul Fredrick. If you’ll recall, Angela got in touch with me last year to say that they loved reading 100 Days, 100 Ties, and could they send me some of their strips. A few days later, I got ten ties (TEN TIES!!) from them. Awe. Some. Anyway, I had a meeting set up with them about a little project (so mysTERious!) I’m putting together, so of course to provide some karmojo to the proceedings I wore one of the ten. Their red tie is so simple it’s elegant, with its blue and white stripes setting off the bold red. Perfect little power tie to set me straight for the phone call. It’s happened a few times in 290 posts. I’ve used a subject a bit too early and regretted it. Last week I used “Tie the power vested in me”, and today would have been more suitable, seeing as I wore a vest. Shoot. Okay, I understand that vested interest truly does contain those three important letters, along with the root word vest. But, it’s easy to verify the 20/20 hindsight cliché in times like these. All this doesn’t hide the fact that I didn’t really like my Tie du Jour. 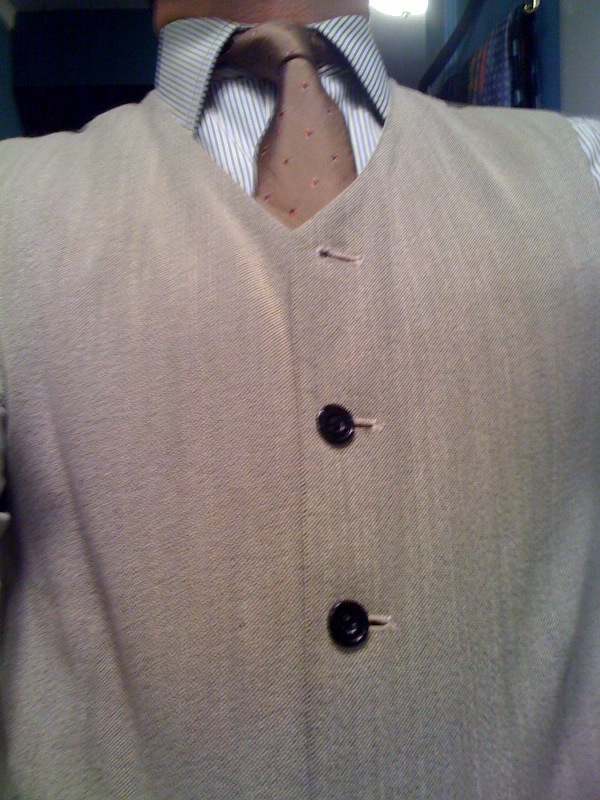 Well, at least not as well as my gray (British translation: grey) vest hides the aforementioned TdJ. This brown strip of blah is from Christian Dior, and even the small blue and red squares can’t save it. It is definitely one of those ties of my remaining collection that I was reluctant to wear. I can’t sugarcoat it, and I have to disregard the tie’s feelings. I know a lot of you will feel sorry for this tie, and accuse me of taking out my frustrations at my not being invited to Oprah’s final show at the United Center. Well, your accusation may be right on the money. It’s just like being picked last in those kickball games (I even got picked AFTER Oprah! )…gonna take a while to get over, and there’s still a lot of ball-kicking going on. 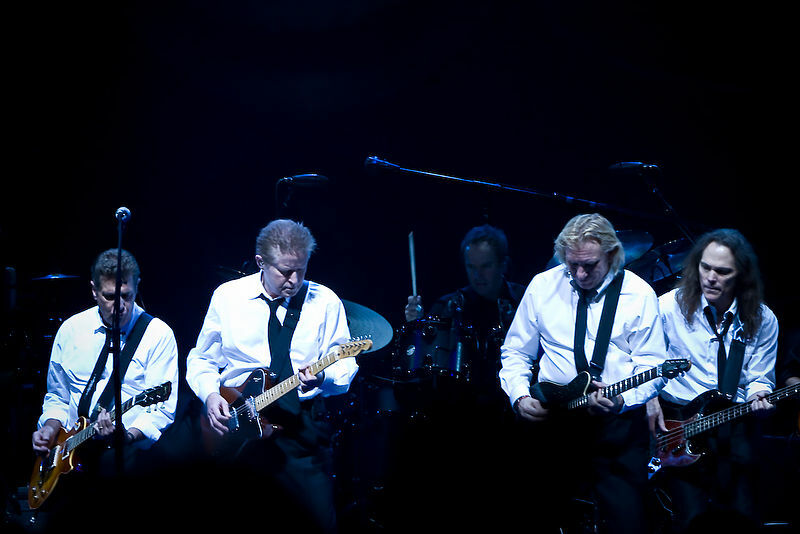 I may as well stick with the Eagles for subject-title inspiration, as I think they’re one of the finer American bands from the 1970s (my first full decade). Think it’s great that they had a good ol’ fashioned feud, saying that they’d play together again when hell freezes over. Then, as history will tell you, that sweet sweet siren called Money sang to them, and thus they sang to us during the Hell Freezes Over tour. 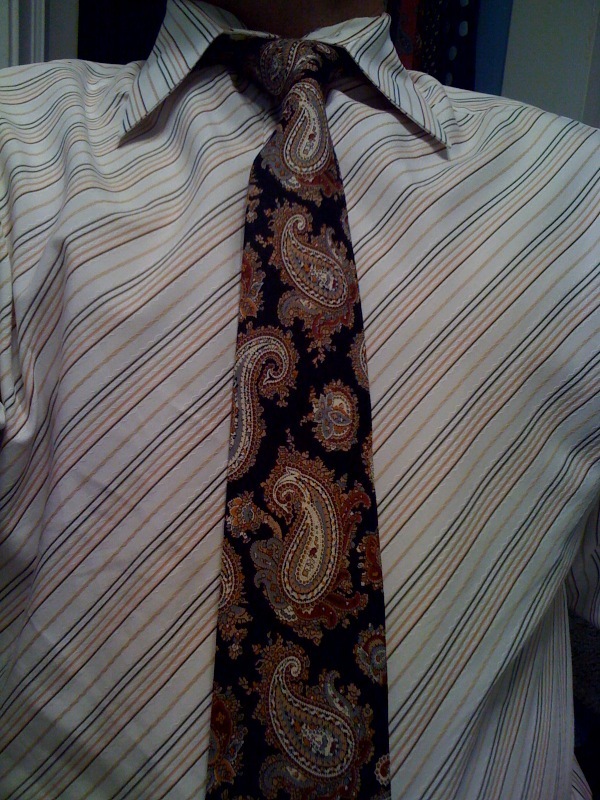 My Tie du Jour is a vintage paisley from Sussex. Black with red and brownish amoebae swimmin’ around, it was saved from the donation pile and given to me by my friends Paul and Cease. Yes, it’s a Giddings Special. They gave me a bag of about 25 or 30 ties, with instructions to donate them on after wearing them (or not). I may have hinted that I’m going to be doing something with my ties, and I can’t tell you details just yet. But, what I do know is that it will generate a lot of ties to donate, and I hope to find an organization that provides ties for young adults, and regular-aged adults, to have for job interviews, in case they can’t afford them. If anyone knows of such an organization, I’d appreciate an introduction. Nothing about this tie is a lie, but I was just having a need to get me some Eagles. A cursory glance at the available photos of Don, Glenn, Joe and the boys told me I wouldn’t find them with ties on. There was a bolo, but it was on one of the Eagles that I didn’t know, and the other guys were shirtless. 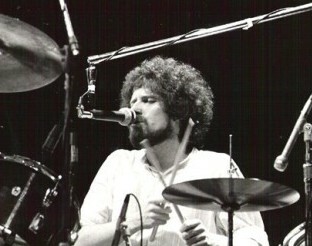 Henley will probably thank me for keeping yet another picture of his Donfro off the interwebs. Oh, shoot, who am I to keep you from that?! 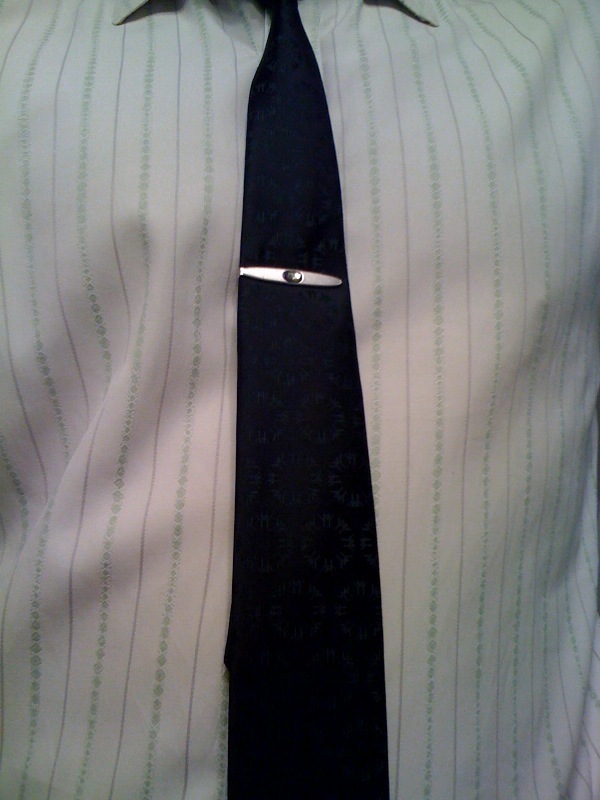 Okay, time to jump down off my soapbox (the ear hairs whistle as I alight) for the Tie du Jour. It’s a sweet blue number from Ben Sherman, and I (think I) got it from Paul Hletko, a GWT alum. Paul is also the master distiller of Few Spirits, where I will soon be employed, at least on a part-time basis. Stay tuned, and stay thirsty.